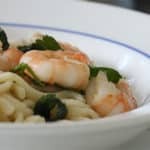 Cooking pasta is one thing, but learning how to turn it into an amazing and delicious pasta and shrimp recipe that is both easy and over the top fantastic, is actually not hard at all! This post will include step by step instructions that anyone can follow. The recipe was given to me by my sister-in-law who made this recipe a few months ago and I was blown away at how good it tasted. So the last time she prepared it I wrote down her instructions and am including them here for you too. Enjoy! The first thing to do is get over any fear you have of cooking shrimp! I rarely cook seafood so overcoming the fear of raw fish or seafood is always a big challenge for me. However, with this recipe it really is super easy. It takes no time at all, you just have to be sure not to overcook it or it will get tough. Since this recipe has a few steps, we first cook the (shelled) shrimp until it’s almost done (right when they start turning color to that beautiful red). If you think you cooked it too long, throw them under some cold water fast to stop any further cooking. We’ll then add the shrimp back in when we create the olive oil and white wine mixture. This will finish off cooking the shrimp for about 2 minutes (just enough time to warm them up again). Use medium size shrimp, not the super small kind as I think those would get too tough to quickly. Everything in this recipe besides the shrimp, you most likely have already in your pantry. Olive oil, garlic, butter, fresh parsley, and white wine. Oh yes, and the pasta. Note that in the image above I used fresh homemade pasta. If you haven’t ever tried homemade pasta it’s awesome. You can check out my review of the Philips Pasta Maker here. The recipe calls for 5 cloves of garlic, and yes it sounds like a lot, but in these types of white wine sauces, you want that garlic. Another thing you’ll notice in this recipe is it uses a combination of both olive oil and butter. This is common with these light sauces and the butter adds just enough creaminess along with that slightly buttery texture to make you feel like you’re sitting in a fancy upscale restaurant. But what really seals the deal is the white wine. Not white wine vinegar, you want actual white wine and a cheap/inexpensive one will do. We’ll put that in at the last minute otherwise it might cook off too much and we loose that added element of flavor. I prefer to use long pasta for this recipe. You can go with fettuccine which is a wider and flatter shape than regular round spaghetti. You can also go with the delicate angel hair (super thin) pasta. So don’t worry if you don’t know which long kind to use, just use what you have. As mentioned above, we used our homemade pasta machine with the fettuccine die cut. I was concerned it would be too thick but it tasted just as amazing! If you don’t know the difference between Italian parsley and curly parsley, Italian is flat and darker green. It has a slightly more bitter taste and is not used as a garnish like curly parsley. If you have the Italian, use that, but if not, you can use curly kind but it will be a little different tasting than what I’ve had. If you don’t have fresh parsley then you can use dried, but fresh is preferred. By the way, I don’t recommend swapping herbs for this recipe. Sometimes I say you can use basil instead of such and such recipe, but in this case keep it to the parsley. Ready to get started?! 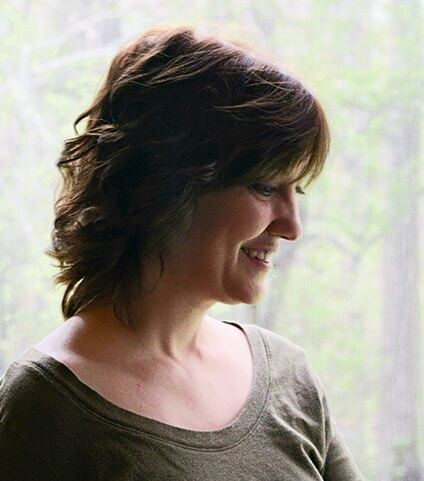 Hopefully I’ve prepped you for the recipe and your confidence is sky high! Here’s the recipe and enjoy! 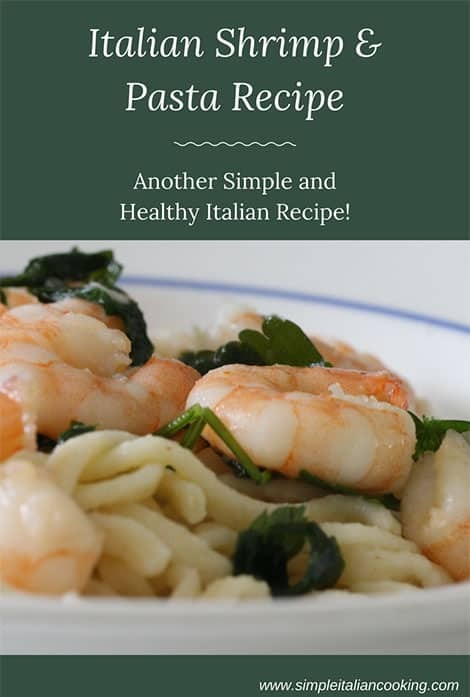 Enjoy an amazing meal with this Italian recipe for shrimp and pasta. Simple ingredients and very easy to prepare and cook. Completely impress your friends and family! 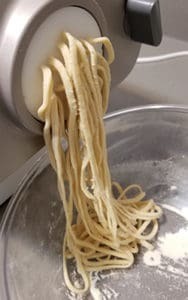 12 oz long pasta angel hair, fettuccini, etc. When the water is boiling, add in the pasta and cook until done/al-dente. Add the shrimp and cook for 2 more minutes until the shrimp done. Remove from heat and serve over the pasta with grated Italian cheese. This recipe is very similar to my linguine and clams recipe I got from my mother. It is a family favorite of mine, so if you don't have shrimp, you can always add some canned chopped clams to substitute.